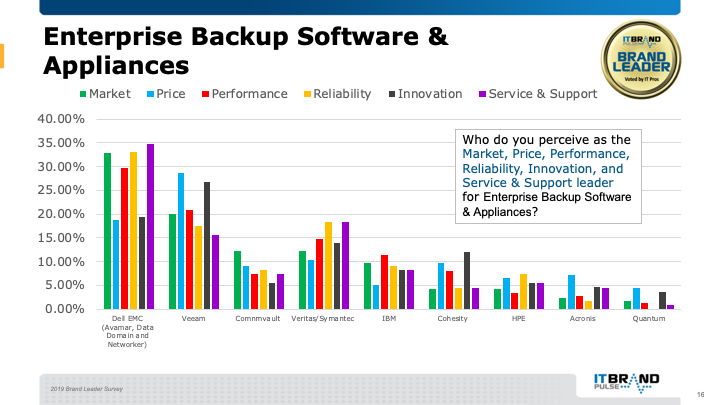 Enterprise Backup Software & Appliances: Backup products which provide some or all of the following in an integrated appliance: backup to tape, backup to random-access media (disk, flash, etc. ), emulate the previous backup targets (e.g., VTL [VTL]), data reduction (compression, deduplication, single instancing, etc. ), snapshot, heterogeneous replication and CDP (CDP). For the second year in a row, Dell EMC was chosen for Market, Performance, Reliability, and Service and Support leadership. Veeam held on to the Innovation title for the third year while snagging Price and coming in second for Market leader. Commvault tied with Veritas for third in voting for Market leader.